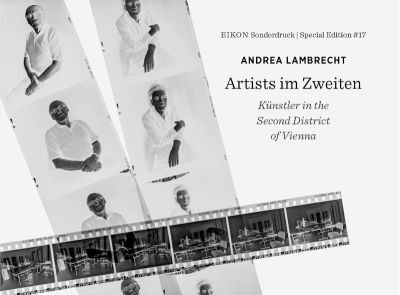 The EIKON Special Edition # 17 is titled Künstler in the Second District of Vienna and brings together a long-term photographic project by Andrea Lambrecht: For seven years she photographed artists (musicians, actors, visual artists, etc.) and their workspaces in Vienna's Second District. The black-and-white portraits on a plain background are thus contrasted with double-page photographs of the studios which were left in their ordinary conditions. The photos are accompanied by statements by the artists, which highlight very different aspects of their district. With its unique history, marked by (Jewish) immigration and persecution, poverty and exclusion, high vacancy rates and bourgeois architectures, the Second Ward seems to have gradually created the ideal breeding ground for artists of all genres. "Andrea Lambrecht’s approach is an ethnographic ... In other words, she takes the studios and the artists to be something “other”―foreign bodies―", writes Carl Aigner in the introduction of the book. This refers to the "natural" representation of workplaces with their workshop character, which is often perceived as not worthy of a picture, but the publication allows a detailed look behind the scenes.